Last week, another fatal accident occurred on Interstate 95 in Jacksonville. According to a report by Jacksonville.com, a man driving a Honda north on Interstate 95 near Bowden Road, when he changed lanes without realizing that another car was occupying the lane. As the driver of the Honda entered the occupied lane, the other driver attempted to avoid the car, but ended up clipping the rear end of the Honda in the process. As a result, the Honda spun out of control, off the road, and into a tree. The driver of the Honda was killed and the passenger was taken to the hospital in critical condition. She is expected to survive. Fortunately, the driver of the second car did not suffer any injuries. While this particular stretch of I-95 can be quite busy, the truth is accidents occur on all types of roads. From scenic rural roadways with their hills and curves, to the larger roads connecting the major cities across our beautiful state, accidents happen. Safe driving requires 100 percent of our attention on any type of road. Most of us drive every day and we get used to the process, forgetting how important it is to stay focused. Many times, drivers do not pay as much attention as they should, engaging in activities like talking on the phone, texting, applying makeup or shaving. All of these activities constitute what has become known as distracted driving. 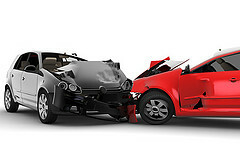 Distracted driving is responsible for a huge number of traffic accidents and deaths nationwide. In fact, cell phone use causes 28 percent of all car accidents each year, according to the National Safety Council. That amounts to 1.6 million automobile accidents annually that could be prevented if drivers would put their cell phones down while on the road. In Florida specifically, lawmakers have begun to crack down on distracted driving by enacting laws such as the recent texting ban that went into effect October 1, 2013. The law-which considers texting while driving a secondary offense-is just one step toward the eventual goal of creating safer roadways. Have You Been Injured in a Traffic Accident? If you or a loved one has been injured in a traffic accident, it may have been caused by the other driver’s distracted or negligent driving. If so, you may be entitled to monetary damages. The law has a built-in mechanism to hold negligent drivers responsible. One such mechanism is called the law of negligence, which makes negligent actors responsible to their victims. If you think that your injuries may have been caused by another driver’s negligent actions, contact an experienced Jacksonville accident attorney today. With an experienced attorney’s assistance, you will be able to better understand your potential case and which option is best for you and your family. To find out what rights you have, and to see what time restrictions may be in place, contact an experienced accident attorney today. – How Does Fault Work in Florida Negligence Cases?